Move over, Sunday Riley Good Genes. There’s a new lactic acid exfoliant in town. It’s called The Ordinary Lactic Acid 10% + HA 2% and is wayyyy cheaper than you. Cos you shouldn’t need to sell a kidney for good skin, know what I mean? Both Sunday Riley Good Genes and The Ordinary Lactic Acid 10% + HA 2% use lactic acid, the gentlest member of the AHAs family. Exfoliate: they dissolve the “glue” that holds skin cells together, so they can slough off and reveal the newer, softer and brighter skin underneath. Hydrate: they draw moisture from the air into the skin, deeply hydrating it. The difference? Glycolic acid’s bigger than lactic acid. And here size matters. A lot. The small size of glycolic acid allows it to penetrate the skin more easily. That makes it more effective BUT also more irritating. That’s why lactic acid is so perfect for sensitive skin. Out of all the AHAs, it’s the one less likely to irritate your skin. Just one thing: Lactic acid is the second ingredient in The Ordinary Lactic Acid 10% + HA 2% and the 6th in Sunday Riley Good Genes. You guessed it, there’s a lot more lactic acid in The Ordinary product than in the Sunday Riley one. That makes Sunday Riley the gentlest option. But also the least effective (when it comes to exfoliation, at least). I wouldn’t call Sunday Riley Good Genes and The Ordinary Lactic Acid 10% + HA 2% dupes. Lactic acid is the only thing they have in common! Sunday Riley also has its fair hare of antioxidants and soothing ingredients to fight wrinkles and help calm down redness and irritation. The Ordinary only has tasmania pepperberry to reduce irritations. Plus glycerin to hydrate your skin. It’s the most basic of the two options. That’s up to you. If money isn’t an issue, your skin doesn’t need much exfoliation and you want the full package (antioxidants and all that jazz), investing in Sunday Riley Good Genes makes sense. If you’re on a budget, want results faster or simply don’t want to sell a kidney to buy an exfoliant, The Ordinary Lactic Acid 10% + HA 2% will do the trick just fine. But I do recommend you start with the gentlest version, The Ordinary Lactic Acid 5% + HA 2% and upgrade to its bigger siblings after a few months. Remember the rule of exfoliation: start with the smallest concentration you can find and build up dose overtime. Is The Ordinary Lactic Acid 10% + HA 2% A Dupe For Sunday Riley Good Genes? I wouldn’t call The Ordinary Lactic Acid 10% + HA 2% a dupe for Sunday Riley Good Genes. It’s a much more basic version. But if gentle exfoliation is all you’re after, it’ll do the job just as well. 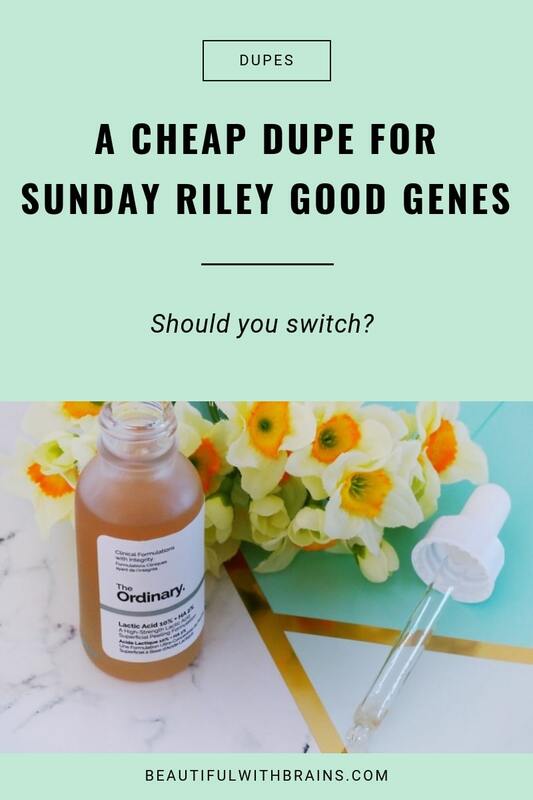 Have you tried both Sunday Riley Good Genes and The Ordinary Lactic Acid 10% + HA 2%? Let me know which one is your fave in the comments below. Sunday Riley Good Genes Ingredients: Agave Tequilana (Blue Agave) Leaf, Cypripedium Pebescens (Orchid), Opuntial Tuna (Prickly Pear) Fruit, Aloe Barbadensis Leaf Extract & Saccaromyces Cerevisiae (Yeast), Glycyrrhiza Glabra Extract, Lactic Acid, Caprylic/Capric Triglyceride (Coconut Oil), Butylene Glycol, Squalene, Cyclomethicone, Dimethicone, PPG-12/SMDI Copolymer, Stearic Acid Glycyrrhiza Glabra (Licorice) extract , PEG-100 Stearate, PEG-75 Meadowsol, Lemongrass Extract, Arnica Extract, Triethanolamine, Xanthan Gum, Phenoxyethanol, Steareth-20, DMDM Hydantoin. The Ordinary Lactic Acid 10% + Ha 2% Ingredients: Aqua (Water), Lactic Acid, Glycerin, Pentylene Glycol, Arginine, Potassium Citrate, Triethanolamine, Sodium Hyaluronate Crosspolymer, Tasmannia Lanceolata Fruit/Leaf Extract, Acacia Senegal Gum, Xanthan Gum, Trisodium Ethylenediamine Disuccinate, PPG-26-Buteth-26, Ethyl 2,2-Dimethylhydrocinnamal, PEG-40 Hydrogenated Castor Oil, Ethylhexylglycerin, 1,2-Hexanediol, Caprylyl Glycol. I’m so glad you said it isn’t the same because i feel like they are completely different the only similarity is they are both lactic acid and i feel like Good Genes is a more comprehensive treatment whereas the ordinary is just one ingredient. Andrew, I agree. I wanted to compare them because lots of people are saying they’re dupes but when you look into it, The Ordinary is a basic version of Sunday Riley. If you’re on a budget, it’ll still exfoliate your skin well but you need to supplement the other ingredients with other products.